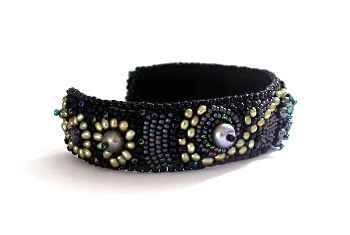 This narrow cuff was the first one I beaded. It uses a mix of seed, bugle and flower beads along with different sizes of pearls. The original bead mix was very dark and needed something extra to 'bring it to life' so I added the very small, green pearls which I think worked. You can see the other end of the cuff here.